WASHINGTON (June 29, 2012) -- New equipment and training, part of the Army's "Capability Set 13" begins fielding in October. The 2nd Brigade Combat Team, 1st Armored Division, out of at Fort Bliss, Texas, will be the first recipients of more than 15 new systems included in the set. Over the next two years, a total of 14 brigades will be equipped with the networking technology that, among other things, brings information such as friend and foe location and streaming video down to the dismounted Soldier's level. 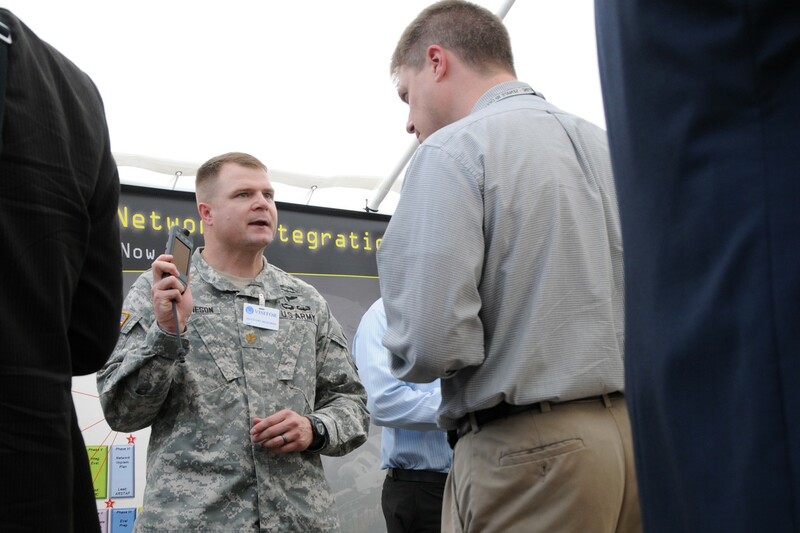 Maj. Kevin W. Hutcheson, program manager, Soldier Warrior, PEO Soldier, demonstrates components of the Nett Warrior system to visitors at a demonstration of Capability Set 13 equipment, June 28, 2012, at the Pentagon. Eight brigades will get the equipment that makes up Capability Set 13. That equipment includes such things as Nett Warrior, the Warfighter Information Network - Tactical 2, the Rifleman Radio, and the Soldier Radio Waveform. An additional six brigades will be equipped with Capability Set 14, the following year. "For the first time, our troopers and our commanders will know where everybody is on the battlefield," said Brig. Gen. John B. Morrison Jr., director, LandWarNet/Mission Command, Army G3/5/7. "We'll have that level of situational awareness. We'll be able to pass orders and graphics to dismounted leaders on the ground; imagery will be able to flow both ways. Think of the power of that operational capability as we extend the network and truly make it mobile to go where our force is needed." Capability Set 13 includes the latest version of the Army's combat network backbone, WIN-T Increment 2. "It extends the number of nodes we're able to operate from in the field," said Brig. Gen. Randal A. Dragon, commander, Brigade Modernization Command. In the past, he said, with WIN-T, full situational awareness was limited to eight command posts. With WIN-T Increment 2, that's now extended to 58 command-post-like situational awareness facilities. That's includes both static and on-the-move command posts, which gives commander and leaders the ability to leave an operating base, and have the capabilities, while moving, that they have while in a static location. The WIN-T increment 2 system, with vehicle-mounted satellite capability, brings satellite communications to the company level and allows Soldiers closest to the fight to have better connectivity. Also in Capability Set 13 is the Nett Warrior system, which is a Soldier-worn equipment set that runs mission-related applications and allows Soldiers to communicate with higher headquarters. Nett Warrior has been modified to make it lighter for Soldiers to wear, said Morrison. Nett Warrior previously had requirements that were "more than a little bit old," said Morrison. Those requirements had not been vetted at an Army Network Integration Evaluation. The system originally had a backpack computer and an eye piece display and weighed about 14 pounds. "That's the last thing you want to be putting on a light infantryman that's already carrying a whole bunch of stuff," Morrison said. The general said Nett Warrior has now been vetted through a Network Integration Evaluation, or NIE, has now been modified to include Android-based smart phones that are linked with Rifleman Radio. The system is now lighter, the requirements are better matched to what Soldiers need, equipment can be fielded sooner, and the Army will save about $800 million. Nett Warrior and WIN-T increment 2 extend the network down to the Soldier level on a hand-held device. "At the infantry team level, the four-Soldier infantry team, you'll see that the leaders have the ability to look down and see where everybody is around them," said Dragon. "That is a major plus. Essentially, the team leader and the Soldiers are trying to answer the questions 'where am I,' 'where are my buddies,' 'where is the threat,' and then 'how do I deliver effective fires?'" Dragon said Capability Set 13 provides the ability to push to warfighters position location information and also allows Soldiers to access database information like the Army's Tactical Ground Reporting System, as well as full-motion video. Additionally, Capability Set 13 increases fires capability, including a laser-targeting capability linked to a radio-target designation. "That allows me to transmit, without the possibility of transposing numbers or data, transmit directly to a firing unit, from a forward observer out in the field," Dragon said. "Everything is electronic now, except for the command's decision on whether to shoot or not. That remains man-in-the-loop; it must." The systems in Capability Set 13 were recently tested in the Network Integration Evaluation 12.2, at White Sands Missile Range, N.M., and Fort Bliss, Texas. There, Soldiers from Army Test and Evaluation Command validated the systems in combat-like conditions to ensure that they work. The idea was to ensure that the equipment works as an integrated system, before deploying it overseas, and it's part of a new acquisition strategy called "capability set management," said Col. Daniel P. Hughes, director, Army System of Systems Integration Directorate. With capability set management, multiple program executive officers and multiple, up to 100, program managers, no longer need to show up to a unit, with separate equipment and systems, and attempt to integrate what they are offering to a unit into what the unit already has. "Capability set management is all about bringing that as a single capability together," Hughes said. Hughes said that with capability set management, equipment is fielded at once to a unit, already integrated and plugged together; that process doesn't have to happen in combat any longer. "That unit knows what it's getting and can implement that in a timely manner," Hughes said, and that saves time by synchronizing fielding and training.